We present a fast method for physically-based animation of fluids on adaptive, unstructured meshes. Our algorithm is capable of correctly handling large-scale fluid forces, as well as their interaction with elastic objects. Our adaptive mesh representation can resolve boundary conditions accurately while maintaining a high level of efficiency. 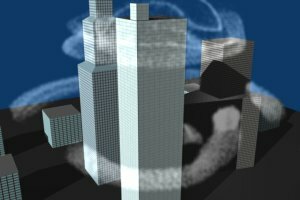 We have implemented our method and tested it on several demonstrative scenes; skyscrapers buffeted by swirling winds, an iconic bridge rocked by gusts of air, and a space station deforming under a flow of fluid-like particles. Our method is capable of exploiting the parallelism of modern multi-core processors. 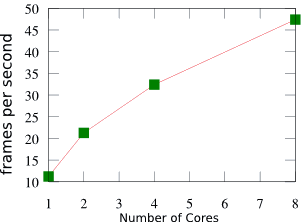 We have parallelized our RDS fluid solver using OpenMP; this figure demonstrates the near-linear scaling we have achieved. This measurement was performed on an SGI Altix machine. In the Proceedings of the Eurographics Workshop on Natural Phenomena 2007. 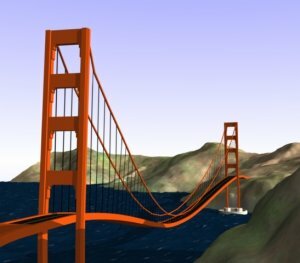 Blender: modelling, rendering, and compositing. Nico Galoppo for help with elasticity and for last-minute deadline help! The rest of GAMMA for helpful feedback.